Bandai is doing more than just figures, but also jumping headfirst into vehicle model kits. They're molded in-color on the sprue, and with a ton of detail. I've seen a few comparison videos of the Darth Vader TIE and X-Wing, which were released right before the holidays, and compared to Fine Molds they're really quite nice. Fine Molds were considered pretty high up there... Kind of difficult to trump really, and vastly superior to Revel kits you'd find in the toy aisle. Their one Millenium Falcon is insanely complex and boasts that it is comprised of the same # of parts as the studio model... That's pretty impressive. These Bandai kits are a different egg but hyper detailed. They're giving a wide variety of display options, even optional different nosecones on the X-Wing (a first). They also have optional "laser blast" effects, and the ships so far have little bases that are actually pieces of the Death Star's surface and they interlock. Pretty slick stuff. Now today, they just listed for pre-order on HLJ kits for the AT-ST and TIE Fighter... The TIE looks like a must-buy for me, to go with an X-Wing. Both are only $16.07 right now too. You get a good bit for that price it seems. I'm anxious to see what they do with a Star Destroyer, Y-Wing, and AT-AT... and of course the Falcon. I wonder if this includes figure kits? Love em! This does not include the figure kits... you know Hasbro's lawyers aren't gonna let that happen. God forbid something done better get out there. Caught these "mini model" kits from Bandai... Since HLJ isn't allowed to sell them I haven't kept up on the Bandai ship kits but these I found scouring Ebay a night. Man, they're really well done. I was provoked into watching some reviews and WOW. The detail on the Destroyer is amazing and I think could even be lighted nicely if you know some basic wiring for LEDs. I'm kind of curious to try my hand at that. 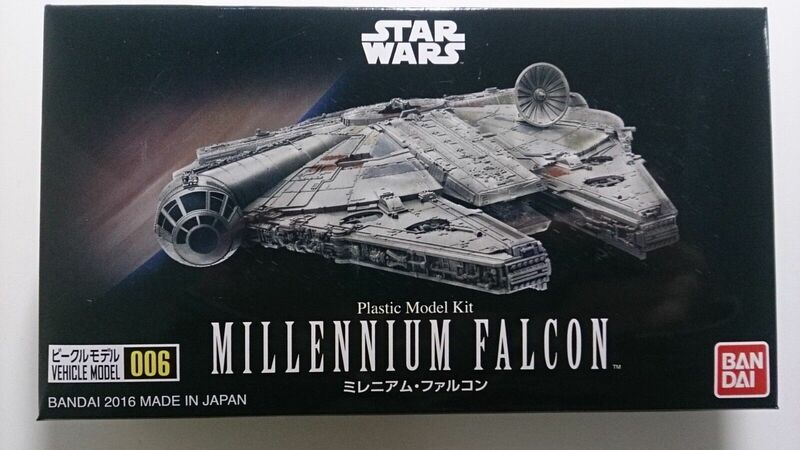 I ordered the Falcon first... probably not a smart move (I need the Destroyer, haha. It looks easier). None of these looks terribly complex mind you, as no Bandai kit is, unless you want to make it complex and spectacular. Their kits are snap together but miles superior to a US snap together kit which is really much more a toy. They have quite a little selection in this diminutive scale too. The ships appear to not all be in-scale to one another as well, obviously, and no specific scale is set to at least some of the ones I've seen, like the Destroyer... I saw someone say a SSD scaled to this tiny Destroyer would still be 4 feet long. Anyway, thought I'd just post... It's a cheap way to get into ship modeling without feeling scared to try... Some simple paint techniques like pin washes would alone make that Destroyer impressive. People should check this stuff out I think, if modeling is something you want to try your hand at. I know this thread is about vehicle kits, but has anyone ever ordered any of the 6 inch scale figure model kits? I know they've done mostly troopers and droids, but the Hasbro fiasco trying to get a R2-D2 and R5-D4 has left me considering getting the R2/R5 model kit. They cost about the same as one Hasbro figure, and apparently are really good/cheap for testing out custom paint for weathering, much like the model vehicles. Edit: Nevermind, found the other thread as soon as I posted this. To stay on topic, these models are very tempting. not sure what you mean about pocket models nick but Bandai makes pocket models and they're normal model kits just very small. Snap together usually have stickers and need painting to really make them nice. I have the Falcon and plan to get more. Diddly you already found the thread but if you have any questions I can answer the there for you. Ah ok were they older things out of production now? I have some of those... 5Below used to have some I think. They're ok. They're fairly sturdy but being just prints on cars stock they're obviously OT an exact replica or anything but they're fairly sturdy as that goes. They'd be easily glued together with super glue too and not come apart at all. I think packs were $1 so I'd buy them randomly just to fiddle with. Thanks Jesse. I'll probably bite on something then. I've been seeing these Bandai kits at my local Hobbytown and Hobby Lobby stores... And they are already pre-painted? If that's the case, I need to jump on these! Been on a Bandai kick lately picking up their line of, well, basically tiny kits... They're now doing, for as far as I'm aware, the first Tantive IV/Correllian Corvette/Blockade Runner model ever... It's in the small kit line, so it's really inexpensive, but that suits me fine. They've also put out the Death Star II in this line. It's really ideal for these larger ships and I hope it keeps going and maybe delves into other eras or even the EU. Tman, sorry I missed your post, I've been extremely busy with life, but the Bandai kits are NOT pre-painted. So just a heads up incase you didn't already find this out. The small kits come with high end "sticker" type decals though, and the larger kits I believe come with both the sticker types and waterslide decals. They're all molded in color though, simple builds but ones you can take to a much farther deeper level if you wanted to. Some of the 1/12 figure kits however are coming with helmetless characters who have their faces pre-printed/painted on so that is going on too right now. I have Han and Luke Stormtrooper and they're great! Their trooper 1/12 kits really don't need painted at all to look amazing too. A stormtrooper right out of the box with the stickers applied is a hell of a nice figure in 6" scale.